If you live in Chennai and if you have a jerkin/ pullover/ a hooded woolen top, you will never ever get a chance to wear it because of the humidity in the place. But when you get a chance to travel in an airplane, you can wear this jerkin. You look cool wearing this ( At least in your opinion). People who have not worn a shorts in their lives will wear a short trouser when they fly in an airplane. There are many who fall under this category. The first time fliers have a real hard time in finding the right costume for their first flying experience and in the end they end up wearing a comical attire. Some people wear sunglasses while travelling in airplanes. A few men use this opportunity to wear their wedding suits while flying. They will never ever get an opportunity to wear the suit anywhere else. Even if you carry only two sets of underwear, one jean trousers and two t shirts, you should use a trolley to carry them. This gives that travelling edge to you. You will have something BIG to check in. 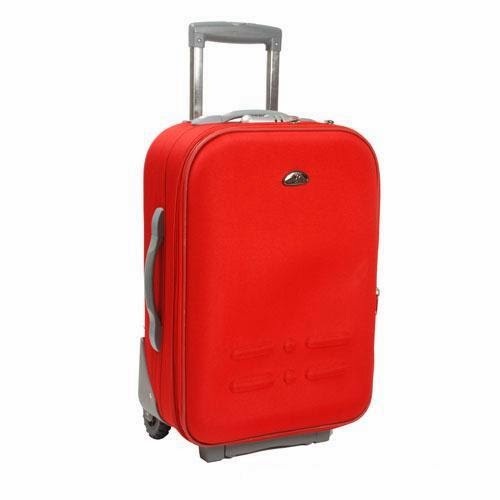 If the security guys ask you to open the trolley bag, you are in trouble. So wash your underwears before packing them in the box. Many people travel these days in airplanes. Most of the flyers between the age of 21 and 26 belong to the IT firms. They fly because they get an opportunity to go On Site. For many such people, it would be their first ever opportunity to fly in an airplane. One way of finding whether a person inside an airplane is a first time flyer or not is to see how he reacts to the in flight announcements. When the in flight attendees (air hostesses) make their announcements on how to buckle your seat belt and how to use the oxygen mask, the first timers will make sure that they do not miss a single line. These are the loud mouthed species who will make sure that they know everything about flying. Their decibels would be always high and they will make sure that everyone around them notice them. They would talk about how other airlines are better than the plane that they are flying in. They talk about world politics, galaxies, Scientology and also behave as if they are the ones who trained the pilots. These people also keep on pressing the button on top of their seats and ask the flight attendants to give them "tissue papers, water, tooth pick, sugar, lemon tea, and everything that is not available on the plane. These people will always try to unbuckle their seat belts and take a stroll on the plane. The simple reason they want to show others is that they know how to walk in a flying plane. They remind me of a Vadivel joke in a tamil film in which he travels in a moving bus in standing position without holding anything; only to fall out of the bus when the driver hits the brakes. These are the Romeos (jollu parties) who love striking a conversation with the air hostesses. They practice pick up lines to impress the air hostesses and sometimes even succeed in conveying the message to them. When the air hostess smiles at them , these guys would think that the air hostesses have fallen in love with them. Chronicwriter has fallen in love with many air hostesses in his life. King fisher was one airline Romeos always wanted to fly because of the air hostesses. But after some time, some Kingfisher airlines started recruiting male flight attendants and also gave pants to the air hostesses, much to the heart break of the Romeos. The pride of India - the Air India is one airline the Romeos will never ever dare to fly because of the airhostesses. It has been a long time since my last Air India / Indian airline travel. 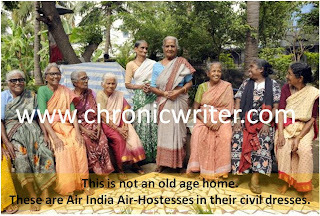 I would like to know from my readers whether they still have the same air hostesses in Air India? You can notice some guys who travel very light. They never show off and you will never even notice them. These are the guys who are fed up of flight travel; but have no other choice because of their nature of work. There are few who love to sit only near the windows even if it is a night flight. Few would love to sit on the aisle seats because that is one place where they can have a better conversation with the air hostesses. This guy does not eat anything that is served during the flight. He saves everything in his bag. This is the same guy who flicks the soap, hand towels from the bathroom. 99% of flyers will behave odd when the airline comes to a halt. Before it comes to a complete halt, the seat belts will be off and people will start standing to get out of the plane as if they were in some hostage situation. Enna avasaramo? I like the window seat no matter what and I also don't like to buy the expensive stuff on board but that does not mean I hoard the free soap and other stuff. I pay attention to the Stewardess' instructions for I want to respect their time and energy. To each her own! I need to wear sunglasses all the time even if they are too dark and I cannot see. A nice and humour filled post friend, few things very useful and right. 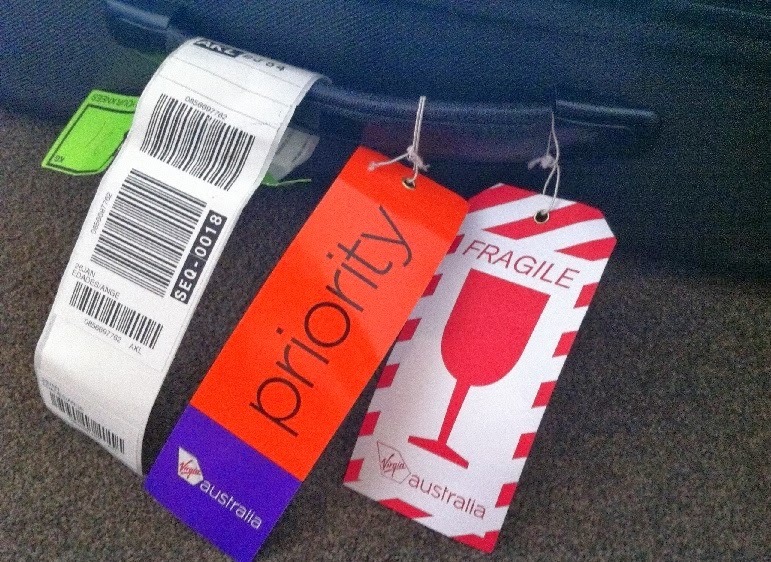 The baggage tags, I would agree with you and it is just a phase of life once we pass it. We ourselves would look back and have a good laugh. Keep it up like your viewpoints and first time flyers must read to avoid OMG moments!